Irritable Bowel Syndrome (IBS) is the disorder of gastrointestinal system characterized by frequent pain in abdomen with repetitive episodes of constipation and or diarrhea. Bloating of abdomen, passing mucus in the stools and constant feeling of incomplete bowel evacuation are also seen in patients suffering from above condition. Food plays a very important part in either aggravating or relieving the symptoms of IBS. Patients suffering from IBS may either show the symptoms of constipation or diarrhea. Cauliflowers are avoided for the same reason. Excessive butter or food items made by using a lot of butter or other fats. Ex. Cookies and fried foods. Avoid drinking carbonated drinks. They can disturb the already poor digestion as in a patient suffering from IBS. Avoid eating refined flours and food items made from refined flours like white breads. 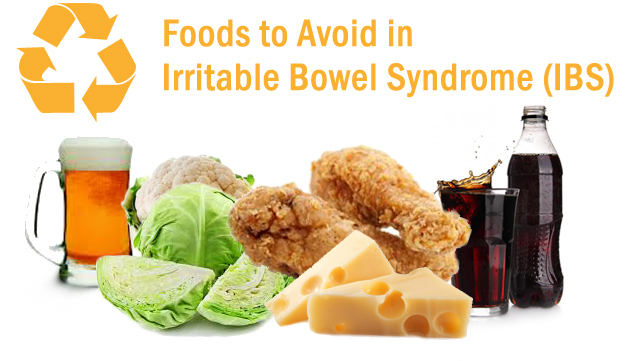 Dairy items such as cheese should be avoided by the patients of IBS. Soups containing a lot of creams. As the creams contain a lot of fats. Excessive fats can cause diarrhea in the patient. So, clear soups are recommended for the patients suffering from IBS. Avoid alcohol intake. Alcohol can irritate the lining of the intestine and worsen the condition. Too much of spicy foods. Too much of spices are difficult to digest for the patients of IBS. Avoid eating cabbage, broccoli, cauliflowers and onions. They are known to cause gas in the person consuming these foods. They can aggravate the disease condtion. Patients of IBS should live a much disciplined life. Here, are the few tips for getting relief from the symptoms. Patients should avoid taking ice cold foods and very hot food items such as soups in one single meal. Take 8-10 glasses of water in a day. Avoid using artificial sweeteners as they contain Sorbitol. Sorbitol is also found in sugar-free sweets, chewing gums and drinks. Include Probiotics in your regular diet. Probiotics contain a lot of gut friendly bacteria and are known to improve the digestion. Try to reduce the stress level. This condition is known to worsen with increased stress levels. Regular practice of meditation and Yoga are very effective and found to relieve this condition.